Hello, my very good friends. It's me, Thor, and we need to talk about cats. I have seen a lot of cats in 2017. Many of them don't seem to give a f*k about anything, and this makes me very concerned. Here are some cats I know who don't give any f * ks. 1. This is Cecil. 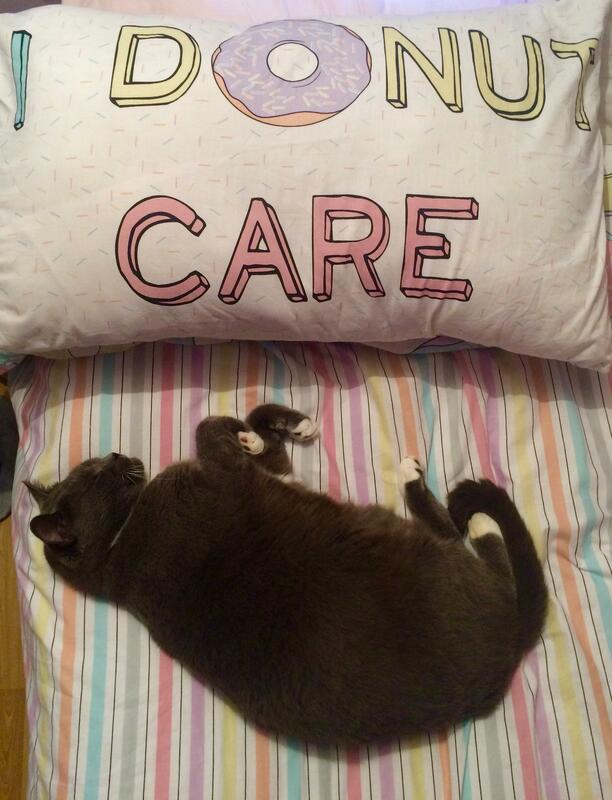 As you can see, he “donut” care about anything. Very perturbing. 2. This is my friend, Cody, who is a good dog, and Ginger, who is NOT a good dog. She is a bed thief! Very concerning! 3. This is Nemo, and he doesn't want to play. Suspicious. Approach with caution. 4. Smokey doesn't give a f**k that he got furs all over his human's clothing. Unacceptable! 5. This is Willow, who will stick her nose into anything. She is small, but a big concern to me. 6. This is Murphy. He cheats at board games and he is not even a little bit sorry. 7. Gus doesn't give a f**k about personal space. Not to be trusted! The cuddles are a lie! 8. This is Boba. He will bully you online and not feel bad about about it. Very mean! 9. Bowie put his footsies in wet paint and doesn't care. Extremely unsettling. 10. Ruby isn't scared of a dinosaur. She should be scared of dinosaurs! I am! 11. Sammy is unplugging the fan and doesn't care that he got caught. Maybe malicious intent? Very much a concern! 12. This is Marshmallow. Dangerous! Avoid! 13. Gilda is getting in the way of food. Why? Why would anyone do that? 14. This is my friend, Layla, and her roommate, Jojo, who is rude, and selfish, and makes me very nervous. 15. Caution! Maggie hides under pillows! Very startling, would not recommend. 16. Elmer gives no f**ks about where his tail goes. None at all. Not even one! 17. This is Penny. Penny is very mean! Do not approach! 18. 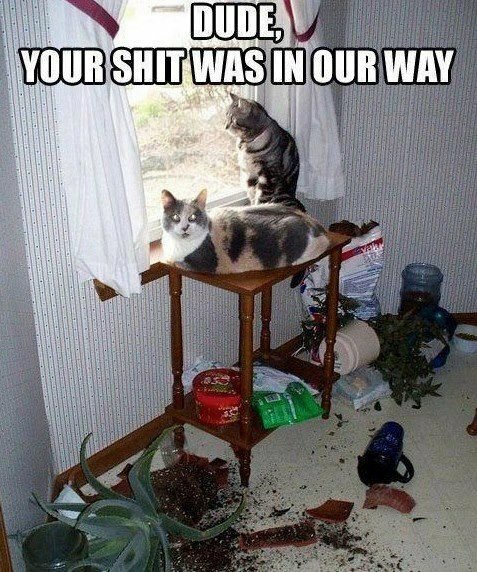 Splotch and Minnie made a huge mess, and they didn't give a single f**k.
19. This is Oscar, and he is almost definitely plotting something. Be wary! 20. Sophie ruined her human's game, and she doesn't care. Very perturbing. 21. Murphy doesn't care about weddings! 22. This is Socrates, and his face makes me uncomfortable. I don't think he has ever given a f**k.
23. Finn is a troublemaker! He wants to destroy everything you love. 24. Lucy doesn't care that her human is trapped under a car! Very distressing! 25. 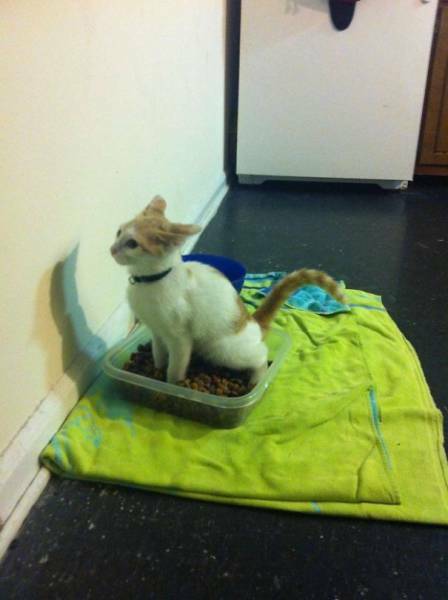 Cats are unpredictable, and this is something my very good friend, Ronan, learned the hard way. Scary! 26. Ziggy's doing a poo in his food! He does not give a f**k about anything! 27. Mr. Fuzzles does bad things and doesn't care at all. I am deeply dismayed. 28. Peaches doesn't give even one f**k that her human is locked out. That's very upsetting! 29. Savannah is tiny and filled with rage! Avoid! 30. Ingrid breaks knick-knacks without batting an eyelash. She definitely doesn't give a f**k! 31. Moomoo farted directly into the face of my very good friend, Sunny. Outrageous and disrespectful! 32. This is Luna. Luna's human thinks she's a bad kitty, and Luna doesn't care at all. Very worrisome! In conclusion, cats are very scary, even the tiny ones. Exercise extreme caution around them. Stay safe out there, good friends!